Surge was designed by Brent Reid from Candeo Design. 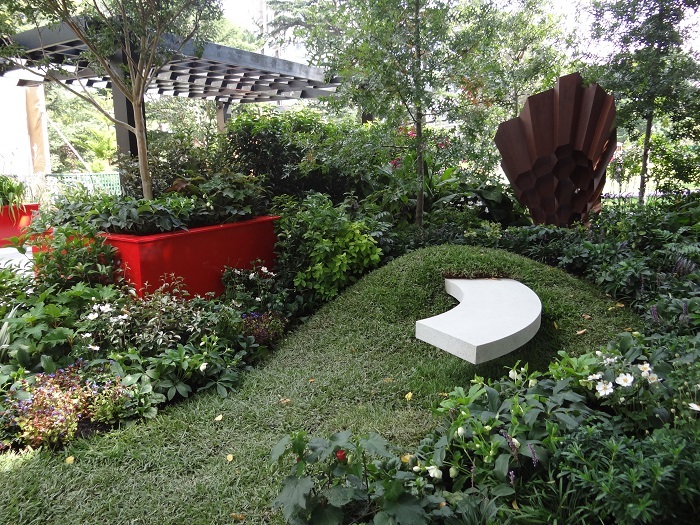 It won Gold this year at MIFGS for it’s bold and unique twist on a Japanese style garden. When asked about how he came to design this style garden, Brent told me that he’d gone on a personal holiday to Japan, so it held very special meaning to him and he was inspired by the vibrant colours especially. The planting style was quite busy, but they all blended in and complemented one another nicely. Lots of different colours, shapes, texture and form, all layered to give a very full effect. Interesting enough though, the plants did not reflect traditional Japanese style. One thing I noticed with colour selection, is that Brent was very creative when it came to tying it all together. Hints of red (abutilon and dahlia) were dotted around the garden beds – just enough to compliment the striking red planters and chairs. Also touches of blue (limonium and liriope) and white (anemone and variegated grass) added as a bit of a contrast. The plants were not clipped or formal either, as you would normally expect from a Japanese garden. This was inviting, relaxed, and casual. The art features were amazing – a very modern twist on a patio roof, custom sculptures, and a stunning concrete seat which seemed to curve itself out of the landscape in a “belonging” way. I also liked the cheeky origami crane sculpture, which was the perfect little touch. Fun, lively, and bold, Surge was certainly something unique and creative.